City College’s Lunchbreak Jazz Band performs on Monday, March 18, 2019, at the Soho Restaurant & Music Club in Santa Barbara, Calif. The band performed five pieces, “Blue Daniel”, “You Go To My Head”, “Mornin’ Reverend”, “La Fiesta”, and “Who Me?”. 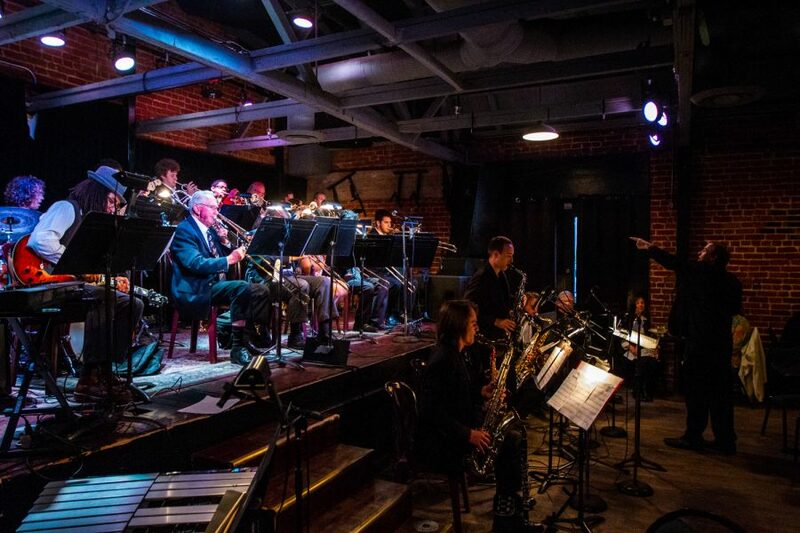 Incredible dynamics and impeccable rhythms from City College’s Lunch Break Big Band and Good Times Big Band astounded audience members in a performance at the SOhO Restaurant and Music Club Monday night. SOhO supplied a cozy jazz venue that blends a classy upscale atmosphere with a rustic background. On one side of the venue, maroon and sea green walls contrast with black and white photos of jazz musicians. On the other side, a brightly lined brick wall adds an NYC jazz club vibe. The Good Times Big Band had a variety of ages working together. The youngest member Cage Englander, who is only 17, jammed with members a few decades his senior. The Good Times kicked the show off on a strong note. Their first piece “Nerk Mobil” brought powerful trombones with a rich overwhelming melody to make the song electric. The piece “Ride the Wind” flowed flawlessly with an exceptional trumpet solo by Englander that extended into a smooth saxophone solo. My personal favorite piece “Not To Be Forgotten,” was a short but beautiful ballad. Director James Mooy introduced the song as “sounding almost like a choir,” and he was spot on. The majestic crescendo to begin the piece reminded me of a concert choir’s elevating voices. The trombone warmed the room. The Lunch Break Big Band did not fail to keep up with the Good Times. Their first piece “Blue Daniel”, consisted of quick strums on the electric guitar that matched the downbeat of the crash on the drum kit that acted as the glue to the song. This piece was trombone-heavy, but it still had a light springy feel to it because of the swinging trumpet solos. Their next song “You Go To My Head” mixed the saxophone with deep legato bass notes that generated a warm and slow sound. The high staccato trombone and trumpet notes were absolutely mind-blowing. James Watson, a music professor at City College, had multiple trumpet solos that were truly astounding. Their final piece, “Who, Me?” began with a classic jazz drum beat with a Sinatra-like trombone, sax, and trumpet sound. A sweet bass solo intermission in the piece carried clarity and amazing dynamics. Throughout the performance of both bands I, as well as almost everyone in the audience, could not stop bobbing our heads, grooving around with our shoulders, and tapping our feet. On the edge of their seats, the audience was poised to applaud the whole concert because they knew it was a special treat to watch. These City College bands are a must-see for jazz fans.